In my last post about Using Prism with Xamarin.Forms & GTK# I showed how to force the use of .NET Standard reference when using NuGet with packages.config. You may prefer using the <PackageReference> tag in your csproj and found that those changes do not work for your scenario. This post will show you how to achieve the same override with PackageReference based projects. 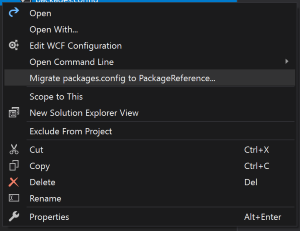 If you just started a new project and do not have any NuGet packages yet then you can switch to using PackageReference in your Visual Studio settings by going to Tools -> Options -> NuGet Package Manager -> General and set Default package management format to PackageReference. Then add your packages as usual. If your reference is inherited because of a higher level reference (i.e. Prism.Core comes from referencing another package, like Prism.DryIoc.Forms or Prism.Unity.Forms) we need to explicitly reference the package first, then we can update the reference to ignore the libs. After the package is referenced unload your project (right-click the project and select Unload Project), then right-click the unloaded project node and select edit (ProjectName).csproj. More info on the PackageReference node can be found here: Package references (PackageReference) in project files. Now when you build and run your project it will ignore the binaries in the NuGet’s lib folder and only add the references you specified. You will need to track version number changes and update the <Reference> node when you update to a new version. Update - A better way!